Granimator is a wallpaper creator with a twist. It makes great use of the iPad’s screen size to display stunning, unique images. You don’t need to be an expert to create high quality wallpaper; you just tap the screen and images will appear. This app from ustwo has cool music playing in the background as you draw. Granimator has in app purchases, but they are optional. They are not required to create wallpaper. There are several free designer packs from artists available, and new ones are always being added for free. Their website has more than 4,500 user created wallpapers available for free. To create a new image, just choose one of the preset backgrounds or shapes. Edit them with the tools provided. Each graphic element has a corresponding sound. It’s the combination of sight and sound that makes it unique. It’s vast user community means there are new wallpapers appearing all the time. You can create art from scratch or use one of the designer packs included. A variety of styles, backgrounds and shapes help you get started. The free packs include works from Moving Brands, Jason Gregory, Rob Boyett aka Bobby Bobson and many others. When you select one of the designer packs, you can use those elements in your wallpaper. Images can be erased, edited and selected. Elements can be drag and pinched. The shapes can be adjusted. If you want a quickie, choose the “randomize” option. All the wallpaper you make can be shared on Tumblr, Facebook, Twitter and Flickr. 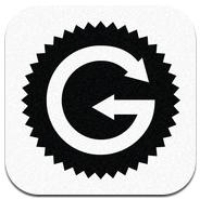 There is a companion app called Grallery showcasing the best Granimator created wallpapers.